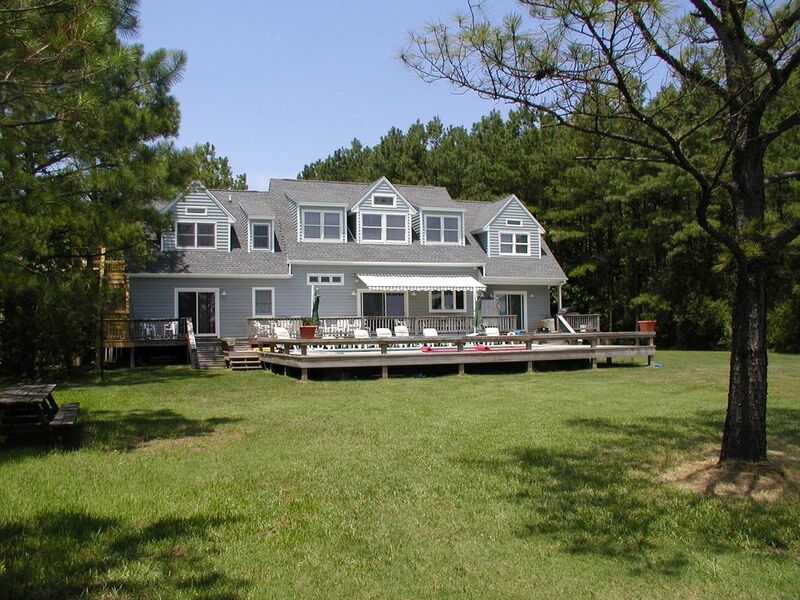 Fishing Cove is a fully-furnished eight-bedroom six-bath waterfront family-friendly house tucked away in a lush pine forest. Our waterfront vacation home is on a very private cove with 2 acres of waterfront property and a large private dock and 3 boat slips. Easy access by car, or by boat from the Chesapeake Bay. Drink your morning coffee on our 12' x 72' deck watching the birds and deer. Fish and crab from our pier. Swim in our pool. Our large welcoming house has everything you need for a relaxed vacation on the Eastern Shore, including accessibility features - electric wheelchair lift, ramps and wide main floor doors. Located on Fishing Creek off the Little Choptank 9 miles from Cambridge, Maryland, we are near Blackwater National Wildlife Refuge, and our shoreline attracts an amazing variety of waterfowl. We have great bicycling roads: Flat and scenic, so bring your bikes. Bring your canoe and explore the shoreline. The house is wonderful any time of the year! Sorry, we cannot accommodate weddings, wedding receptions or large group events. With 3 married children and five grandchildren we added a second floor to Fishing Cove to accommodate all of us as well as our friends. When our family isn't using Fishing Cove we offer it to other families so they can enjoy it as much as we do! We bought this house because of its PERFECT location. It is only 60 miles from Annapolis so getting there is easy, going from the hustle of city life to perfect peace in an hour's drive. It started out as a 3 bedroom, 2 bath house that we enlarged and improved to fit the needs of our own large extended family. Then we decided to offer it to other large families for their vacations so they can enjoy it too! We have a large house with lots of space for multi-generational family get-togethers. There's something to do for everyone. We have 2 small rowboats for guests to use at their own risk. Since life-vests must be fitted to the individual using them, please bring your own vest. Pool is gated for safety and also has an automatic pool safety cover. Electric wheelchair lift, ramps, wide main floor doors. The Cambridge location is the heart of the Chesapeake Bay area and is a convenient drive from New York, Philadelphia, Ohio and Florida. Families gather from these and other areas to enjoy everything the Bay has to offer - the wildlife, the ocean and all the historical sites. There are also great restaurants, festivals, 2 world-class waterfront golf courses, tennis and boating of all types. Fishing, Crabbing and boating couldn't be better. Just tie up at our dock and take advantage of it all. Golf: The River Marsh Golf Club at the Hyatt Regency Chesapeake Bay Resort provides golfers a secluded haven to enjoy golf as it's meant to be played -- with classic styling, wide fairways, sculpted bunkers, generous greens and tees to reward and challenge all levels of players. The 17th hole is a par 3 that stretches 200 yards from the tips. Awaiting the bold player is a dramatic carry over Shoal Creek to a large putting surface guarded by three artfully crafted bunkers. The green is backdropped by majestic trees and a stunning vista of the broad Choptank River that flows into Chesapeake Bay. Clearview at Horn Point's Golf Course is challenging and fun for any level player. You'll enjoy remarkable views of the beautiful Choptank River from several holes on the course. This par 72/73 course plays to just over 6,450 yards from the back tees. With ponds, traps, tree-lined fairways, and firm fast greens, solid ball striking and course management is a must.